From Pushkin's famous poem comes the tale's protagonists, brave Ruslan and his beloved Ludmila. This unique and good-sized piece from the hand and mind of Palekh artist Shemarova features multiple distinct scenes woven together in the iconographic style typical of Palekh art. On the front of this glasses case is Ruslan gripping tightly to the evil Chernomor's beard as they fly through the sky. Ludmila is locked away in Chernomor's palace on the left, and on the right is a scene in which Ruslan seeks guidance from a wise old man. 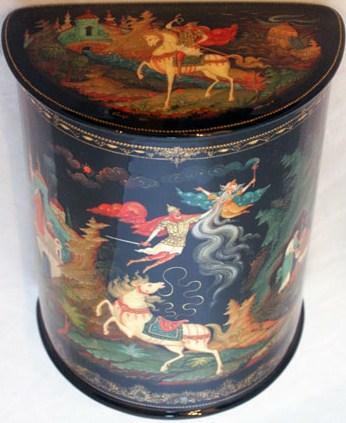 The lid depicts the early part of Ruslan's journey to rescue his betrothed, including the giant head he must defeat to retrieve the sword that would in turn defeat Chernomor the wizard. The flat back of the box features the happy return of the couple to their own lands. The classic style of Palekh is perfectly represented here, and the decoration is top tier.